Let’s all raise our glass to Scott Tavenner, Founder of Savino, who finds ingenious ways to serve and preserve your favorite drinks. His quest started with wanting to save the rest of an opened bottle of wine. 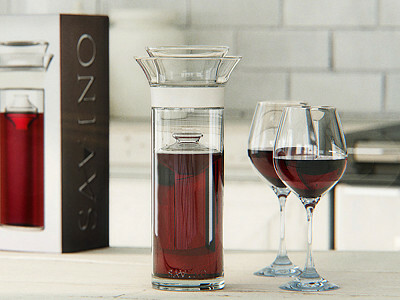 After 15 years of research (that’s dedication), he developed the Savino Wine Carafe. This elegant glass cruet not only serves wine but keeps it exceptionally fresh, night after night, for up to a week after opening. A snuggly fitted floating seal protects the wine from oxidation, while a screw top prevents spillage. Scott didn’t stop there, though. 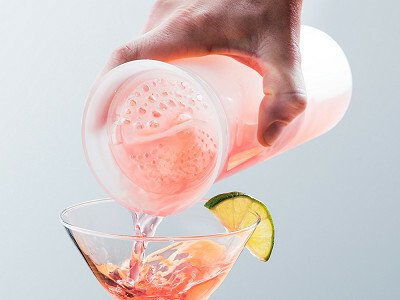 He went on to shake up cocktail making with Shaker 33, which he calls “The Best Cocktail Shaker Since Prohibition.” The locking lid keeps your drink inside—secure enough to shake with one hand. When you’re ready to serve, the lid easily unlocks and you can adjust for larger holes to pour faster or smaller holes for better straining. To Scott and his dedication to lifting spirits we say, “Cheers!" What is the difference between the carafes? 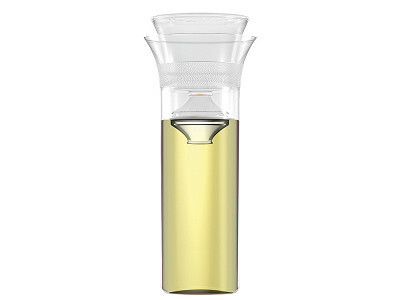 The Wine Saver Carafe is made of glass, so it's a little heavier but looks great on a table. The Enthusiast is made of plastic, so it's nice if you're planning on taking your wine outdoors. Both keep wine fresh for up to a week, so the material does not impact the performance of the product. It’s Scott the founder of Savino. After working on Savino for over 15 years, I’m honored to share Savino with the Grommet community today, which also happens to be my birthday. I look forward to chatting and answering your questions. After emptying the carafe, I assume you should wash all parts in soap and water and thoroughly dry before refilling, am I correct? Are all the parts dishwasher safe? Yes, all the parts on Savino are dishwasher safe. While we recommend washing the parts after each use...although I have to admit sometimes I empty the savino and put another bottle of the same varietal back into the same carafe and in those cases I just rinse it out. Also, should the wine in the carafe if not used in one day be left out at room temperature or refrigerated? @Joseph Savino works in the refrigerator or at room temperature. Savino was designed to fit in the refrigerator (it is shorter than a bottle of wine) so this is our recommended method but either works (some people like the way it looks on the counter and don't want to hide it away in the refrigerator). Happy birthday, Scott! How much does the carafe hold? Cheers! I've always been taught to decant or aerate red wines to open up the aromas and flavors. It seems that immediately shielding the wine from air would defeat this purpose. True? @Susan Hi Susan, Oxygen is a friend and foe of wine. It does help red wines open up but then too much and the wine goes bad. If you have a really big red wine that needs decanting, I recommend pouring the wine into the carafe and wait a few minutes before you insert the float. Can the same Savino be used for white and sparkling wine? 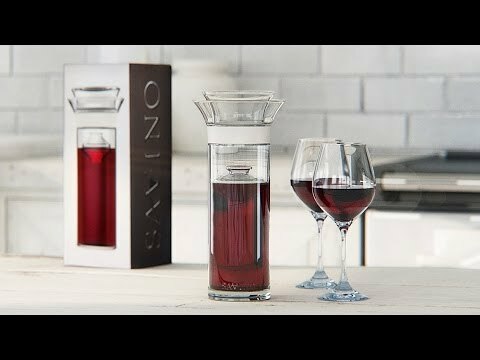 In the video, it looks as though the float's diameter is slightly less than the decanter's. Does the silicon seal actually touch the inner wall, or is there still some little bit of air exposure? @Alan Hi Alan, thanks for the detailed question. The float covers ~99% of the surface area so there is a small gap between the exterior of the float and the inner wall of the carafe. 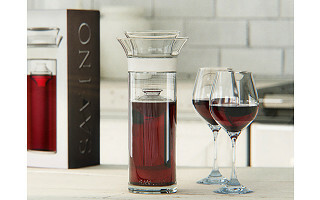 This makes the Savino super easy to use and still keeps wine fresh for a week. Hi Scott, how long will the wine 'last'? @Judy Hi Judy, it will last a week. We say open any bottle on Tuesday and still enjoy it on Saturday as this seems to encompass the majority of use cases. @Scott, well said, it's a rare bottle of open wine makes it past Saturday night. Scott - Happy Birthday! This is great idea! And Oscar said it so well - seldom does a bottle opened on Tuesday make it to Saturday in my home! hello Scott,I am a retail seller and would be interrested in buying these wholesale .Who would I be able to get in touch with to inquire about this? @Guest hi ron, absolutely. drop me a line distribution at savinowine and we can chat.